I'm so excited to be co-hosting on Rachel's blog Lines Across www.linesacross.com. I'm SUPER new to blogging so to have this opportunity to co-host after blogging for only 5 months is a big deal for this newbie! I can't wait to see what every links up!! Since I've been blogging and subscribing to other blogs I'm amazed at how many creative and talented people there are out there in blog land! Show me whatcha got. Check back later and read my post about the Annie Sloan workshop I took on the weekend! Everyone is welcome to join this link party. Share something crafty or creative. Share a recipe or a household tip. There are four simple rules. 1. Follow Lines Across (I also will be sharing some of my favorites throughout the week through Facebook, Twitter, and Pinterest). 2. 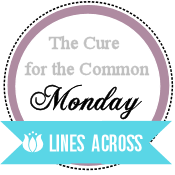 Post the Cure for the Common Monday button somewhere on your blog (or link back to Lines Across). 3. Visit and comment on at least one link for every post you share. 4. Visit the co-hosts, Chica is Artistica and My Passion for Decor and follow their blogs. Thanks for co-hosting this week! What a great opportunity! Have a great time and enjoy everything! Thanks for co-hosting. Happy to be following you via GFC. Hi Melody, thanks for co-hosting. I'm following you! Hope you'll stop over for a visit at Quirky Vistas.